Craig Heath, 35, the last U.S. senior championship skater to win the compulsory figures competition in 1991 (Minneapolis, MN), has been skating professionally for the past 10 years as a soloist for a myriad of show productions. From 1996 to 2002, Heath has played the roles of Andy and Sid in Feld Entertainment’s Disney on Ice’s production of Toy Story. “It was a great six years and a time that I will never forget,” he said. During that time he has also competed in the American Open competitions, winning silver medals in 1998 and 2000 and a bronze in 2001 and for the past three years has been the president of the Professional Figure Skaters Cooperative (PFSC), taking over for Scott Williams, who remained on staff as Treasurer with Dan Hollander serving as vice-president. The not-for-profit organization promotes professional figures skating worldwide. 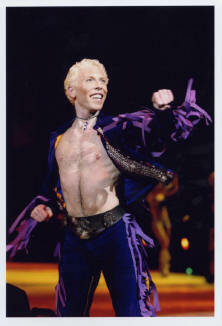 In 2001 he choreographed a number for 1988 Olympic silver medalist Liz Manley to Madonna’s Music. And has been teaching an ice class for the past seven years. Among his accomplishments, Heath is best known for completing 10 double axels in a row for many performances of Disney’s Toy Story on Ice. Heath says he will return to Holiday on Ice this coming fall for season two of Hollywood. Heath has two homes in the U.S. one in Mill Valley, Calif., the other in Sun Valley, Idaho.